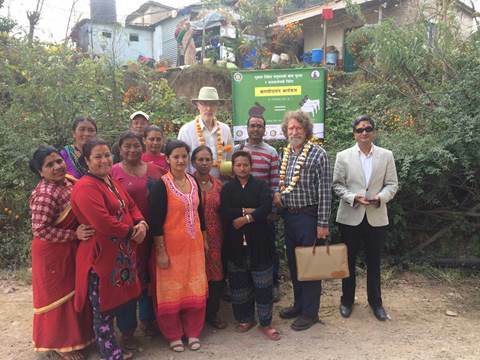 More than two years ago a terrible earthquake struck the country of Nepal and Dr. Steven Lukefahr, Regents Professor at Texas A&M University-Kingsville, started working with people there to set up rabbit projects to help those hardest hit. Recently, Lukefahr traveled to Nepal with retired political science Professor, Dr. Richard Hartwig, to check up on how the villagers are doing providing rabbit meat for their families and local buyers. Prior to the earthquake, no one in the Chogua village had rabbit projects, now, Lukefahr said, about 300 people in the village are benefitting and the project is spreading to other communities. He said the women in the family spend the most time working with the rabbits. “Women spend more time at home. They prepare the meals and are more likely to add rabbit meat to a meal for their children. They also are more knowledgeable about family health and nutrition than men,” Lukefahr said. “I had a great trip to Nepal. The Rotarians there were very hospitable. They are doing remarkable work and will collaborate with us in preparing a Rotary International Global Grant proposal for next year,” Hartwig said. The current rabbit projects were provided by funds from several Rotary Clubs in Texas and from a Rotary District 5930 grant, Hartwig explained. “The rabbit projects help feed people where there is a lot of malnutrition and do so on a sustainable basis. Selling rabbits they produce provides income for families with monthly incomes between $100 and $150 a month for a family of six,” he said. Rabbit farming is a great way to address the nutritional deficiencies that are widely prevalent in rural Nepal, Lukefahr said. And rabbit farming can be achieved with a small amount of start-up capital by utilizing locally available resources for hutch construction and feeding requirements by producing rabbit feed on seemingly barren or wasted land in the area. Rabbit manure can be recycled to help grow organic vegetables for the household while regenerating the productive capacity of the soil, Lukefahr added. Prior to the earthquake in Nepal in 2015, Lukefahr was already working with Ujjwal Chapagain who owns the Himalayan Rabbit Farm. Much of the farm was destroyed in the earthquake, however, he was able to rebuild thanks to donations from members of the World Rabbit Science Association.